My generation is the very last one to use pencil and paper as the primary method of gathering, compiling, and sharing information. So for me, rescuing recipes from the past where our ancestors scribbled beloved dishes on scratch pads, napkins, receipts, or back of envelopes has taken an even greater sense of urgency. However, I also love writing about how an old favorite becomes trendy again, reintroducing itself to a whole new generation. The Apple Pie is the perfect example. Do you ever remember life without it? But have you seen the newest version of our nation’s sweetheart dessert? Introducing you to the latest viral food sensation, the Apple Pie Cookie. It’s fun, it’s delicious, it’s cute, and it makes you feel like you can eat one and not gain a pound! 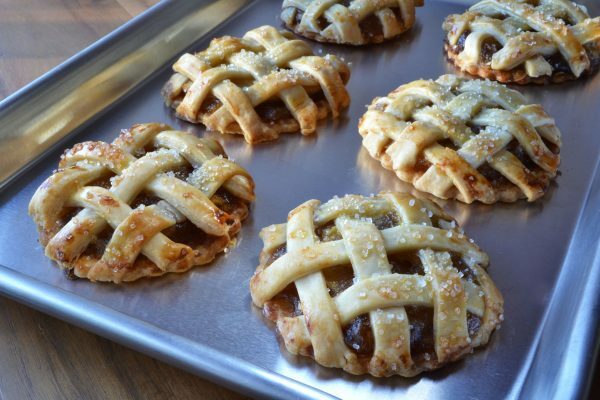 The Apple Pie Cookie uses all the same ingredients as a good old fashioned apple pie – it’s just reconstructed into little lattice-topped discs of yumminess. Nothing will ever replace our love for the iconic American apple pie, but I think even Granny Smith would love these! Preheat oven to 350ºF. Roll out both pie crusts from the first package. With a 2" round cookie cutter, cut out as many mini dough rounds as you can (roll out leftover pieces of dough and make more rounds until dough is used up). Place them on a lightly greased or foil-lined baking sheet. Brush the tops with a thin coating of beaten egg and sprinkle 2 tbsp of sugar evenly over all of the dough rounds. Bake for about 10 minutes, or until lightly golden-brown. Meanwhile, make filling. Peel, core, and cut apples into very thin slices. Place in bowl and toss gently with one teaspoon of lemon juice. Place slices in a medium pot. Add remainder of lemon juice, sugar, butter, cinnamon, and salt. Over medium high heat, stir very gently and cook just to soften apple slices (about 2-3 minutes - do not let the apple slices get mushy). Add cornstarch and incorporate to thicken mixture. Remove from heat and set aside. Remove mini dough rounds from oven. Place 4-5 apple slices on each cooked round. Roll out both pie crusts from the second package. Cut each crust into thin strips, ¼-½" thick. Make lattice design over the apple slices. Gently pinch around the edges. Brush lattice tops lightly with remainder of beaten egg. Sprinkle with decorative sugar and return to oven. Cook until tops are golden-brown (about 15 minutes).